A weightless foundation that blends seamlessly for a second-skin feel and included foundation brush. - 85% of women agree after immediately applying this foundation, that their skin looked smoother and more even. - 94% of women agree that after immediately applying this foundation, they loved the way their skin felt and the foundation felt lightweight on their skin. - 97% of women agreed after using this foundation for 4 weeks that their pores look less visible. - 91% of women agree that after using this foundation for 4 weeks, their skin looks smoother and appears more even. - The majority of women agreed after 4 weeks of using this foundation that their skin looks better even without makeup on. - The majority of women agreed after immediately applying this foundation that the redness in their skin is instantly covered. - 91% of women agreed after using this foundation for 4 weeks that their skin looks more youthful. - The majority of women agreed after 4 weeks of using this foundation that their fine lines and wrinkles appeared softened, their skin fees and looks firmer and the appearance of dark spots is reduced through topical coverage. - The majority of women agreed after 4 weeks of using this foundation that their skin fees smoother, looks less textured an less dry. - The majority of women agreed after 4 weeks of using this foundation that their skin appears healthier-looking, more radiant and younger looking. - The majority of women agreed after 4 weeks of using this foundation that their skin looks brighter and feels plump with a youthful glow. - The majority of women agreed after 4 weeks of using this foundation that their skin texture appeared improved and they saw a reduction of dark spots with topical coverage. Dispense 1-2 pumps of foundation onto the back of your hand. Dab the Double Ended foundation brush into the product, apply in thin layers, starting in the center of the face and sweep outward. Ingredients: Aqua (Water), Cyclopentasiloxane, Dimethicone, Alcohol, PEG-10 Dimethicone, Ethylene/Acrylic Acid Copolymer, Hdi/trimethylol Hexyllactone Crosspolymer, PEG-4, Dimethicone/Vinyl Dimethicone Crosspolymer, Isononyl Isononanoate, Trimethylsiloxysilicate, Myristyl Lactate, Polyglyceryl-4 Isostearate, Passiflora Incarnata Flower Extract, Camellia Sinensis Leaf Extract, Ascorbyl Tetraisopalmitate, Retinyl Palmitate, Glycerin, Helianthus Annus (Sunflower) Seed Oil, Tocopherol, Stearoyl Inulin, Sodium Chloride, Synthetic Fluorphlogopite, Disteardimonium Hectorite, Sodium Dehydroacetate, Aluminum Hydroxide, Tocopheryl Acetate, Cetyl Dimethicone, Parfum (Fragrance), Silica, Phenoxyethanol, Disodium Edta, Sodium Lauroyl Glutamate, Lysine, Triethoxycaprylysilane, Magnesium Chloride, Palmitoyl Hexapeptide-52, Butylene Glycol, Benzyl Alcohol, Carbomer, Polysorbate 20, Palmitoyl Pentapeptide-4, Citral, Limonene, Linalool. May Contain (+/-): CI 77891 (Titanium Dioxide), CI 77491, CI 77492, CI 77499 (Iron Oxides). Have to say I spend my life on a quest for the perfect foundation and this is it! !I got light color and its the best match I have found. Coverage is great and it feels so light on my skin. Will definitely repurchase! I am so impressed with this foundation.It feels light, does not settle into pores, and does not have any smell so it will not interfere with your perfumes.This foundation gives my skin a non greasy finish.I will consistantly order this product. 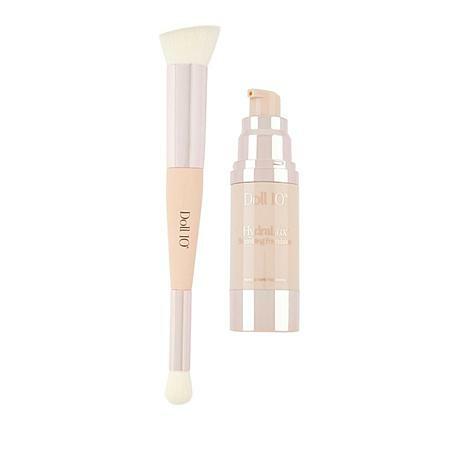 Finally found a foundation that agrees with my middle age face.It covers my blemishes without feeling heavy, and goes on like a dream with the foundation brush. I LOOOOVE the way this foundation looks. It's easily buildable... But my favorite thing about it is how it dries! It dries so quickly and leaves NO sticky feeling whatsoever.